One small step for the market, one giant step for Widerøe, Norway’s 84-year-old regional airline, as it steps into the jet era in April 2018. Founded in 1934 by Viggo Widerøe, the regional airline Widerøe has been in uninterrupted operation until today and the flight plan forward is interesting. The first aircraft was a Waco seaplane that took to the skies over Oslo in 1934. Later, DHC-3 Otters were used and in the late 60s the well-known little green DHC Twin Otter was introduced on Widerøe’s regional routes in Norway, the aircraft specially developed to operate from short airfields and in tough weather conditions. In the 90s, the DHC Dash 8 turboprop model was phased into the fleet, total 41, resulting in all Twin Otters being disposed of together with the DHC Dash 7 (four-engine turboprops). SAS acquired 60% of Widerøe in 1997 and the remaining 40% in 2002 and Widerøe was used as a feeder into SAS hubs together with operating on short-field airports in remote areas in Norway. In 2012, SAS went into serious financial troubles, which it overcome but opted to sell off 80% of the shares in Widerøe in 2013 to an investor group (Torghatten ASA, Fjord1 and Nordland County). The remaining 20% was sold to the same investor group in 2015. Widerøe has continued to operate on domestic regional and short-field airports with its DHC Dash 8 fleet, together with a small number of seasonal international routes. In January 2017, a new roadmap was written for Widerøe as its owners signed a contract with the Brazilian aircraft producer Embraer, the third largest aircraft producer in the world after Boeing and Airbus, to buy three E-Jet E190-E2 aircraft with an option for twelve more. The first E190-E2 is scheduled for delivery in March and Widerøe is the launch customer for this aircraft, which will be put into scheduled operation with a one-class configuration with 114 seats. Being a launch customer is not necessarily an optimal solution, as the first production line of a brand new aircraft type often results in more technical issues than those of the same type produced after logging many flight hours to detect most types of problems. The new E190-E2 will be the first jet aircraft without propellers ever operated by Widerøe since it started-up back in 1934, and during 2018 another two of the planes will be delivered. The first routes will be on domestic sectors between Bergen, Bodø and Tromsø commencing in April. Next out will be a route between Bergen and Billund in Denmark in June followed by connecting Bergen with the German cities of Hamburg and Munich together with Gothenburg in Sweden, as well as a route between Kristiansand and London during August. 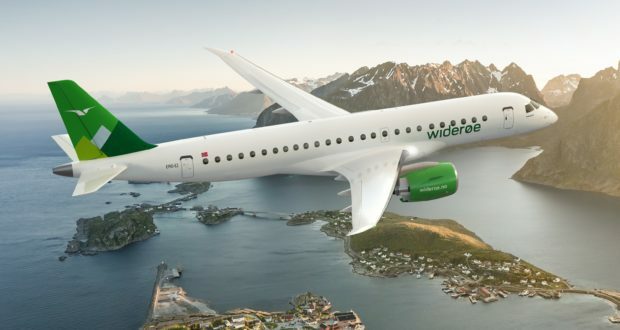 It is likely Widerøe will not compete wing to wing with its two big brothers SAS and Norwegian on domestic and international flights. Instead, cooperation with other airlines is an alternative, together with continuing to operate on underserved domestic and international point-to-point routes suitable for E190-E2 operation, serving the most important markets for incoming tourism to the west coast of Norway – being Germany and the UK. This initiative is highly appreciated by the tourism and hospitality business in the area as flights from Germany and the UK have been significantly cut since the downturn in the oil and offshore business in Norway. A new strategy for Widerøe is ACMI (aircraft-crew-maintenance-insurance) contracting with other airlines, and first out is Finnair. The partnership with Finnair is interesting as Finnair wants to grow its connectivity from its hub in Helsinki to more cities in the Nordic countries to satisfy the growing demand of incoming passengers from Asia, mainly China. An ACMI contract reduces the risk for the aircraft owner, as in the case of Widerøe/Finnair it is Finnair that takes the largest risk and needs to book most of the seat capacity. Widerøe, meanwhile, gets experience to operate under a large long-haul carrier umbrella, which will require on-time performance and service levels according to its own performance and product. Widerøe will operate between Bergen and Helsinki and between Tromsø and Helsinki, commencing in May 2018. If the cooperation with Finnair works out, it may result in more contracting for Widerøe as Finnair’s growth on its Asia routes will require connectivity to more cities in Norway and the 114-seat E190-E2 is a useful tool to supply this capacity. Not forgetting the fact that political and economic relations between Norway and China are back on track, something that will trigger more tourism and business travellers via Helsinki and business opportunities for Widerøe. Finnair also cooperates with the Swedish airline group BRA on the route between Stockholm Bromma and Helsinki. Bromma is a hub for the BRA-Finnair codeshare on many BRA routes to domestic cities in Sweden. There is no doubt that Finnair see a strategic opportunity to cooperate with regional airlines in the Nordic countries, securing capacity and feeding between its ever-growing Helsinki hub and cities in the Nordic countries, by using 100-120 seat aircraft that is an ideal size to pick up traffic to destinations not served by Finnair itself, like Oslo Gardermoen, Stockholm Arlanda and Copenhagen Kastrup. There are good business opportunities for regional airlines in the Nordic countries as long they do not compete directly on routes with the big players SAS and Norwegian. An excellent example is the new commercial partnership between Widerøe and Norwegian announced on January 26, a partnership that will include features like: the interlining of tickets and fares between the two airlines on domestic flights; minimum connection time at all airports in Norway reduced from two hours to 30 minutes (at OSL 45 minutes); and checked-in luggage will be through-checked to the final destination. Widerøe: 41 aircraft – 46 destinations – 3000 employees – HQ Bodø in Norway. BRA (Braathens Regional Airlines): 27 aircraft – 13 destinations – 1300 employees – HQ Malmö in Sweden. Finnair: 76 aircraft – 91 destinations – 4800 employees – HQ Helsinki in Finland. Norwegian: 144 aircraft – 150 destinations – 9000 employees – HQ Oslo in Norway.